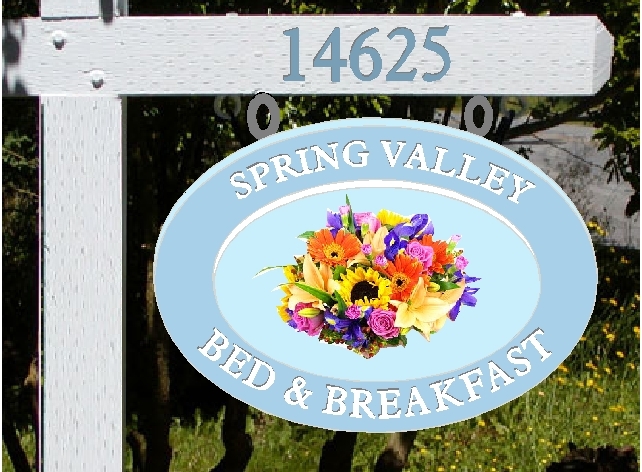 This attractive sign has an elevated central oval (additional 1 in thick HDU laminated to main oval signboard) with flowers digitally-printed on 10 year vinyl, and then clear-coated for additional lifetime. Flowers could also be artist-brush painted in oil enamels, at an additional cost. Text is raised, all signboards are smooth. We also supplied the post and lateral hanger, made from pressure -treated fir. This is an attractive sign at out lowest price.